Android as the name suggests, it is a modern font armed with the much needed technological advancements to help users get immense pleasure and satisfaction while using it. 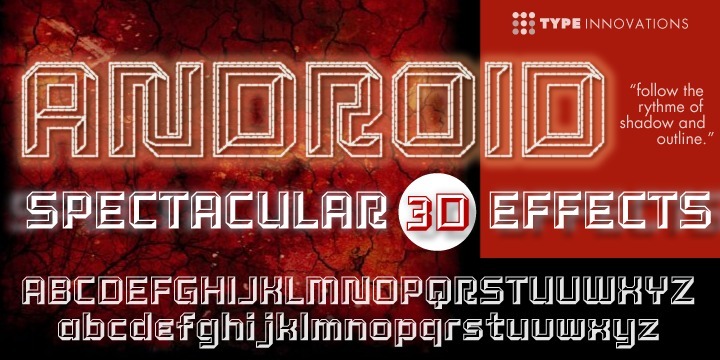 The typeface is precisely an experimental 3D shadow outline font. It has been originally created by Alex Kaczun, the popular American type designer. The font is revered for its unique lighting developed by the beveled edge in conjunction with an outline font, which was extremely difficult to create. However, the result was worth the effort and time. Android typeface provides users with a dynamic headline display that nearly pops off the page. This is what makes it different from other new fonts. The ground-breaking new typeface has been blessed with a true three dimensional quality which gives an edge to the users. You can use the regular Android while setting tight leading for smaller point sizes. The ‘Tall’ form of the typeface can be used for larger headlines. You can also experiment with Type Effects in Illustrator or PhotoShop software to get some extravagant additional 3D effects.